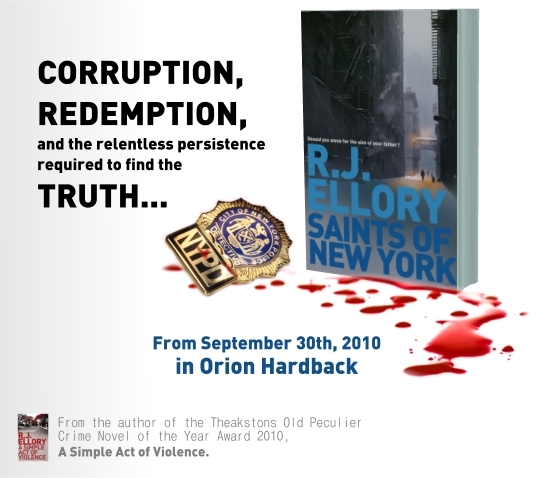 The winner of the Theakston's Old Peculier Crime Novel of the Year 2010 for A Simple Act of Violence embarks on a new stand alone - SAINTS OF NEW YORK and is happy to explain its background. I am often asked whether or not I write an outline or a synopsis for the novels I write. To date, the answer has always been, ‘No, no outline, no synopsis’, and I think that will always be the answer. Writing a novel – for me – seems to be a spontaneous and organic thing, constantly changing, constantly in flux, and in this way I seem to be able to surprise myself with the twists and turns that a plot can take, even as I write it. I can change my mind. I can change the ending. The guilty party in A Quiet Belief In Angels became someone else entirely merely fifteen pages from the end of the book. Perhaps I imagined that if I didn’t know who the killer was all the way through the book, well no-one else would! However, there are two constants for me; two things I always establish before I begin a novel. The time and place, just as one concept, is vitally important. A Depression era-set serial killer novel is going to be an entirely different novel from a Washington-based contemporary political conspiracy. So the era and locale is vital. 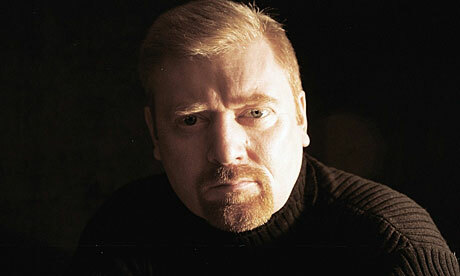 But, even more important for me, is the mood and atmosphere with which I want to imbue a story. How do I want the reader to feel when they are reading the book? How do I want them to remember the book long after they have finished it? With Saints of New York I wanted to create a very definite feeling: a sense of bleak desperation, a feeling of darkness, a sense of constant and imminent foreboding. I remembered films from the seventies – ‘Klute’, ‘Serpico’, ‘The French Connection’, and then more recent releases such as ‘8mm’, ‘The Pledge’, ‘The Flock’ and ‘Seven’, and it was that kind of depth, that kind of disillusioned and defeated realism that I wanted to convey. Of course, I didn’t wish to depress the reader, but merely to take a step away from conventional plots, to leave behind central characters who seem to always get it right, to make guesses and giant leaps of assumption, and always be vindicated in their hunches. The world is flawed. The people who inhabit the world are also flawed – both criminals and cops. They make mistakes, they screw things up, they get it wrong. It does not always work out well for the protagonist; the antagonist does not always get his comeuppance. This is what I wanted the book to be about – the simple truth, the simple reality, the frustration of real police work. In the early part of 2008, just a couple of days after Obama had been inaugurated, I had the good fortune to go to Washington with the BBC to make a little feature piece about A Simple Act of Violence. ‘Simple Act’ is a tough book about a tough subject – the covert ops activities of the CIA during the war in Nicaragua, the illegal trafficking of cocaine out of Managua into Miami in CIA-chartered aircraft, those same aircraft piloted by known criminals who had been given carte blanche and exemption from prosecution by the US intelligence community, all this set against the backdrop of a contemporary Washington serial killing spree that spirals beyond anything the lead investigator, Detective Robert Miller, can envision. I thought about that for a long time. I considered the kind of effect such a job would have on your life. Could you keep a marriage together? Could you raise kids? Could you go out and enjoy a ballgame, a barbecue, a weekend in the country with that kind of shadow hanging over you all the time? Perhaps, perhaps not. After I returned from Washington I started to think about forgotten victims. I looked at the fact that something in the region of eight hundred and fifty-thousand Missing Persons Reports are filed each year in the USA alone. I considered the fact that ninety-three percent of abduction victims are dead within three hours…dead before anyone even knows they’re missing. I thought about the ones that were never found, the bodies never located, the parents never knowing what really happened to their son or daughter. I imagined what that would do to your life. Would you ever be able to let go, to get over it, to carry on? I didn’t believe so. That was where Frank Parrish came from for Saints of New York. That simple meeting in Virginia was where ‘Saints of New York’ was born – as an idea, a vague fleeting image, a feeling of the kind of story I would like to write that dealt with the obsession of one policeman to learn the truth of what had really happened to a young victim. Why? Because if he didn’t, no-one else would. The victim – a teenage girl - was a nobody, someone who had fallen through the net, someone about whom no-one really cared. Until Parrish decided to care. Until he decided to learn the truth of her fate, no matter what it took. And so I started writing, and – as with all books – it became consuming, something I thought about all the time, something I worked at furiously. ‘Driven’, my wife calls me, and perhaps I am. It became an important story to tell, not out of any high-minded and pretentious view that I had ‘something important to say’. Quite the opposite. I was humbled by it in a strange kind of way. Writing about someone like Parrish made me all-too-aware of the fact that there are thousands of people who spend their lives in the service of others, who sacrifice personal security, stability, family, vacations – all the things we take for granted - in an effort to help others less fortunate. ‘Forgotten victims’ was the phrase that came to mind time and again, but as I wrote the book I started to consider the ‘forgotten saviours’ even more. These were the real ‘Saints of New York’, the real saints of any city, any neighbourhood, where such work is undertaken by self-effacing and anonymous people, people often criticized and harassed, people viewed as corrupt or self-serving, when – in reality - they were quite the opposite. Saints of New York is not an easy read. I didn’t want it to be, never intended it to be anything other than brutal and harsh. All I wished was that it would convey some small part of the emotional effect I had experienced when I spent time in Washington with June Boyle from Homicide, with Brad Garrett from the FBI. I wanted to present some small part of the reality of their lives, to get under the reader’s skin, to make them feel how I felt when I stood by the edge of an industrial lake and listened to Brad tell me of the one case that still kept him awake at night: the discovery of a thirty-gallon trash can that had floated to the surface of that same lake, the lid wired shut, and within it the dead and drowned body of a young mother and her baby boy tied together inside. Twenty-five years of homicides, twenty-five years of seeing the very worst that human beings were capable of doing to one another, the only FBI agent to ever track a terrorist assassin out of the US into the Middle East, to bring him back, to see him charged, arraigned, tried, convicted and executed for the gun killing of two CIA agents on US soil, the agent who was assigned to the Starbucks employee murders in Georgetown…and the case that still gave him nightmares was the seemingly senseless death of a baby. That was what I wanted to do, to tell that story, to share that viewpoint of humanity. And I hope that is what I have achieved. I am proud of Saints of New York. It is the eighth book to be released, and a book I hope that people will enjoy. But the main thing is the feeling of the thing, the emotion it evokes. Truth be told, I care little whether people remember my name, even the name of the book, but yet – when reminded of that book six months after having read it – I would consider it the highest compliment if they were still able to recall how it made them feel. That’s what I like about the books I read, and that’s what I am still trying to accomplish with every book I write.